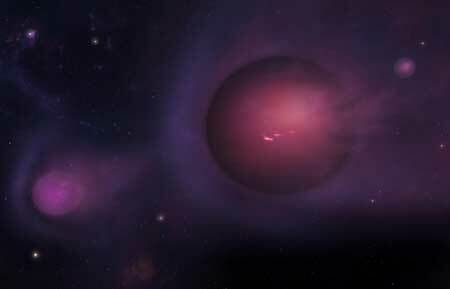 (Nanowerk News) Every few thousand years, an unlucky star wanders too close to the black hole at the center of the Milky Way. The black hole's powerful gravity rips the star apart, sending a long streamer of gas whipping outward. That would seem to be the end of the story, but it's not. New research shows that not only can the gas gather itself into planet-size objects, but those objects then are flung throughout the galaxy in a game of cosmic "spitball." Girma is presenting her findings at a Wednesday poster session and Friday press conference at a meeting of the American Astronomical Society. She also finds that the vast majority of the planet-mass objects - 95 percent - will leave the galaxy entirely due to their speeds of about 20 million miles per hour (10,000 km/s). Since most other galaxies also have giant black holes at their cores, it’s likely that the same process is at work in them. Once launched, it would take about a million years for one of these objects to reach Earth’s neighborhood. The challenge will be to tell it apart from free-floating planets that are created during the more mundane process of star and planet formation.